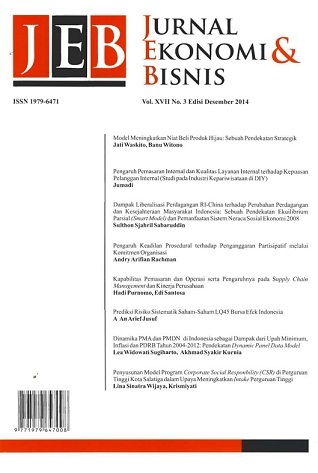 This paper aims at investigating the behavior of foreign direct investment (FDI) and domestic direct investment (DDI) in Indonesia, which is expected to be explained by several explanatory variables including the setting of regional minimum wage, inflation, as well as regional domestic product. More specifically, the investigation is focused on the effect of annual increase in the minimum regional wage, provided that it is a sensitive issue for investors. Using 33 provincial level data in a period from 2004 to 2012, this paper uses a dynamic panel data which allows us to see the behavior of direct investment in the short run as well as in the long run. The result shows that an increase in the regional minimum wage setting reduces both DDI and FDI in the short run. However, in the long run, an increase in the regional minimum wage is likely to increase both DDI and FDI. This is likely indicating that in the long run an increase in wage is expected to be accompanied by higher productivity, eventhough in the short run higher wage increases cost of production which will undermine investment. Baltagi, B. H. 2005. Econometric Analysis of Panel Data (3 ed.). England: Wiley. Case, K. E., dan R. C. Fair. 2007. Prinsip-Prinsi Ekonomi (Y. A. Zaimur, Trans. H. W. Hardani & D. Barnadi Eds.). Jakarta: Penerbit Erlangga. Gujarati, D. N., dan D. C. Porter. 2012. Basic Econometrics. Jakarta: Penerbit Salemba Empat. Mankiw, N. G. 2006. Makro Ekonomi. Jakarta: Penerbit Erlangga. Rahardja, P., dan M. Manurung. 2008. Pengantar Ilmu Ekonomi (3 ed). Jakarta: LPFEUI. Saputra, M. J., A. Setiawan, dan T. Mahatma. 2007. Analisis kointegrasi data runtut waktu indeks harga konsumen beberapa komoditas barang kota di jawa tengah. Program Studi MIPA UKSW. Sukirno, S. 2000. Makroekonomi Modern (1 ed.). Jakarta: PT Raja Grafindo Persada. Tjandraningsih, I., H. Nugroho, dan S. Tjandra. 2008. Buruh Vs. Investasi (Mendorong Peraturan Perburuhan yang Adil). Bandung: Yayasan AKATIGA. Winarmo, W. W. 2011. Analisis Ekonometrika Dengan Eviews (3 ed). Yogyakarta: UUP STIM YKPN. Winarno, W. W. 2009. Analisis Ekonometrika dan Statistika dengan EViews (2 ed). Yogyakarta: UPP STIM YKPN.